Unity Games has released a new RPG game with a good dose of adventure that seems to ensure plenty of fun for the fans of the genre. It requires at least iOS 4.3 and Android 2.2.3 and a quite powerful device to run (in the App Store and the Google Play you can find the list of compatible smartphones and tablets). 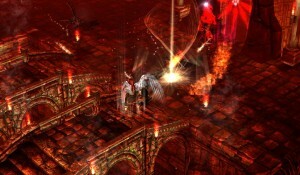 Archangel is a dungeon crawler that quickly enters into action. The forces of evil have risen and our character is the responsible for the end of the rebellion. The novelty is that your character is not simply trying to “save” the Heavens, but he has to crush the rebellion as an example for the future generations. The game features a highly detailed 3D graphic section (hence the limited devices supported) and good gameplay. The controls are simple and consist basically on click into the ground to move and click on the enemy to attack. As we progress and acquire new abilities and weapons, the controls become more varied. However, one of the main criticisms of the game is the feeling of lack of new actions (mainly due to the repetition of the same attacks throughout the dungeon). Interestingly, we can raise the dead enemies and they will become part of our army. Archangel has 30 levels, over 100 items to collect and a large number of spells to discover. It also includes a kind of betting system at the end of each level where we can increase the rewards, or lose them all! The game is stored in the cloud, so you always have the saved game and ready to move on. However, make sure to have Wi-Fi when you try to download game because the file has a weight of almost 400 MB. You can find it for only $1.99 in the App Store and the Google Play.